Mothers of a Nation is a feature film, short film and 25 piece photography exhibition about a unique group of empowered women farmers. The film follows a wife and husband from America, photographer and filmmaker Ansley West, and organic farmer, Rafe Rivers as they research Ugandan farming methods. They are astonished to find predominantly women in the fields who through friendship reveal their complicated lives ridden with sexism, suffering, sickness, and solitude. The women combat poverty and HIV through sustainable agriculture projects and solidarity resulting in their improved health, happiness and livelihood in their homes. Ansley and Rafe are lead through rural Uganda and into the homes of a diverse group of women by two powerful women leaders, Florence Lumbandi and Alice Lubunk. These two women are a force of renewed hope and change and many women come to them for support and guidance. 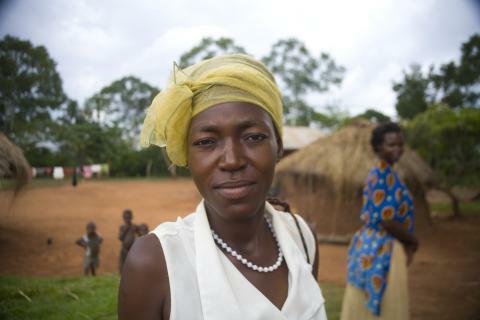 Through service to their communities, they are able to provide unique perspectives into women’s role in Ugandan Society as a whole and how agriculture can be utilized in changing not only financial futures but also psychological states of being. Collectively, these female farmers of Southern Uganda delve into their personal histories, to tell the story of rural Ugandan Society. Womens’ suffrage and the onset of HIV are the two most influential changes to traditional roles. The effects are described as profound and often devastating. However, as Ansley, Rafe, Alice and Florence travel through rural Uganda, the landscape of womens’ history unfolds into one of hope and prosperity as each woman takes control of their desperate situations through agriculture, education, and solidarity.